Green-Lemonade.com » I Scream, You Scream…. Although the forecast is calling for light snow here in central Ohio today, we had a hint of summer weather over the weekend, so my husband and I took the opportunity to indulge in some of our favorite ice cream. 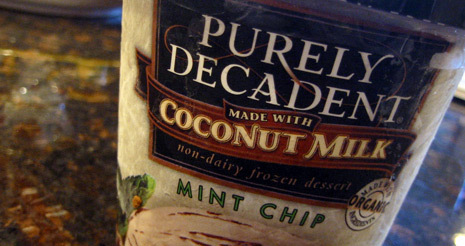 Some members of our family are lactose intolerant so we are always on the look out for a dairy-free alternative that isn’t loaded with artificial ingredients and still tastes good.� Purely Decadent’s Coconut Milk Frozen Dessert fits the bill. Featured on the Today Show a while back, Purely Decadent is also vegan and lower in calories.� Check out all the delicious flavors, our favorite is the Mint Chip!� I also like the SO Delicious Coconut Milk Yogurt and SO Delicious Soy Yogurt too.